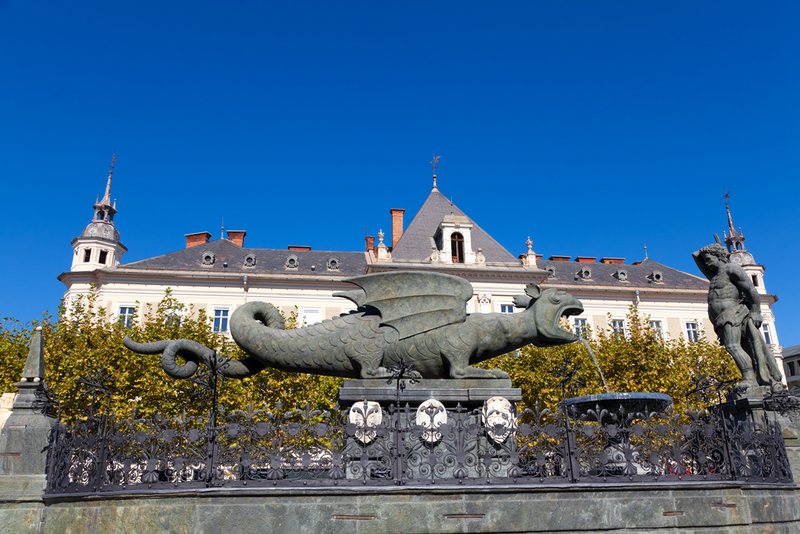 Let Weimar’s rich cultural and literary history enchant you during a cozy weekend away. Here’s the thing: I love historical figures. There’s just something about learning what inspired humans to become who they did that fascinates me. I also love museums, poetry and endless walks in parks, which may just be the reason Weimar is one of my favorite cities in the whole world. Good news: you do not need to be excessively interested in any of that to enjoy the spirit of this good old German small town. Having seen and loved it in every season, I now feel qualified to become your personal tour guide for such an extraordinarily peaceful city, haunted by the sweet ghosts of artistic masterminds that shaped the era now known as ‘Weimarer Klassik’ (Weimar Classicism, 1772 – 1805). Whether you’re looking to find out more about Germany’s history or simply need a day off the noise and stress of your daily life, this is the place to go. In 1758, Anna Amalia became duchess of Weimar and the town began its transformation to becoming the cultural capital of Germany. As one of the only female rulers of her time, she wanted the city’s education to focus on music and arts, which quickly drew in poets, painters and thinkers from all over the continent. To this day you can clearly see what her priorities were and it almost feels like a journey to simpler times. Colorful houses line the streets, the clicking of horseshoes dominate cobblestone squares and a blooming park embraces the entire city center. Germany’s favorite poet, author and playwright, Goethe, was born in Frankfurt in 1749 and died in Weimar in 1832. 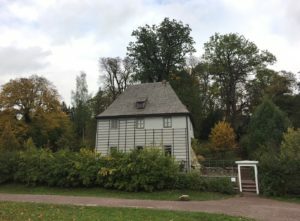 On a special invitation by Anna Amalia’s son, Carl August, Goethe came to town, moved to what is now known as his Gartenhaus (garden house) in the heart of the Park an der Ilm and soon fell in love with the city’s charm. His beloved Ginko tree, which has inspired many poems, is still standing today. Despite many travels to Italy, he always returned to Weimar, where he eventually moved to what is now known as his Wohnhaus (living house). He is buried next to his friend, fellow writer Schiller, whose house was located only a few yards from Goethe’s townhouse and serves as a museum as well, in the ‘Fürstengruft’, only a short walk from the city center. If you’re travelling with children, you can’t miss the multi-media show of the town’s history at the Weimarhaus. 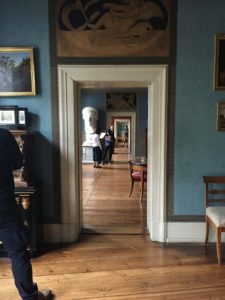 The tour takes you through a series of rooms, guiding you through time from the first settlers to Napoleon’s arrival at the castle all the way to a mini show of Goethe’s most famous work, Faust. Narration is available in English- check their website in advance. 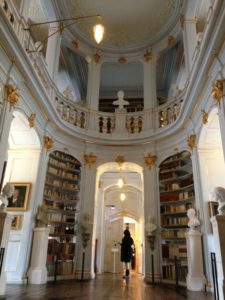 The Anna Amalia library is simply beautiful. 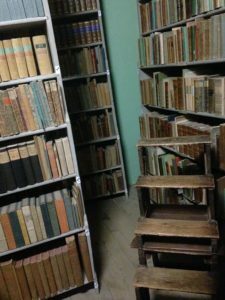 So even if you’re not interested in the literature itself, a wall of old books never fails to astound. Only a limited amount of visitors are allowed to go in per day so make sure to schedule it early in the day and buy your ticket in advance. Discover the city from an entirely new perspective: via horse-drawn carriage. Depending on the length of your tour, it will take you to its most important sights and the majestical Park an der Ilm. While we remain glad that we don’t have to travel by coach these days, it’s a surprisingly soothing way to get around and gain a general idea of where everything is located. Many coachmen and women are bilingual to answer any questions you might have. No matter what your plans are or how long you’re in town for, you have to stop by the Goethehaus. It’s a magical combination of pompous furniture, bright accessories and anecdotes from the writer’s long life with just the right amount of books: innumerable. 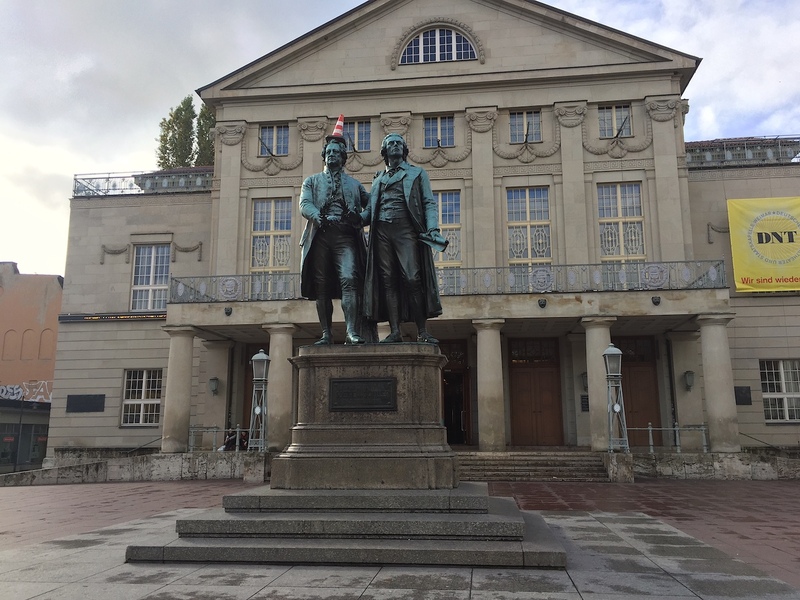 It serves as the home to the Goethe Nationalmuseum and houses many sculptures, paintings and belongings that he collected throughout his life. Every room is painted in a different color; its meanings are explained in an English audio guide. The beautiful garden can only be visited during the summer months but you can catch a glimpse through the windows facing it. Just make sure not to pose too closely to his personal carriage because the alarm will go off. Trust me on this one. Other visitable houses include the afore mentioned Schillerhaus. It may look less spectacular at first due to the writer’s lack of fame in his lifetime, but still gives excellent insight into 18th century life. The Bauhaus Museum is an architectural museum on Theaterplatz, established in 1995, which exhibits over 250 works by Bauhaus School teachers and students (1919-1933). Bauhaus style is famous for its modernist, independent designs. 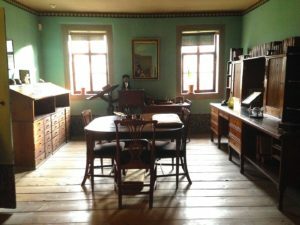 Goethe’s garden house, a miniature version of his actual house, if you will, (his first residence there) has a number of original notes on display. Even if you don’t want to go inside, a (free) stroll through his colorful garden will warm your heart and soul any time of the year. Speaking of warming our hearts; a nice cup of hot chocolate or coffee can not be missing during your tour, so make sure to stop by Café Gretchen (which dubs as a highly recommended family hotel) or Lily’s Waffel und Mehr on Frauenplan for homemade cakes and drinks. If you’re looking for some good old German delicacies, you have come to the right spot. Gasthaus zum Weißen Schwan (‘White Swan’) is located next to the Goethemuseum on Frauenplan as well. Three deliciously traditional restaurants line the city’s market square, Markplatz: Elephantenkeller (elephant basement, as you do), Zum Schwarzen Bär (‘Black Bear’, apparently naming restaurants after large animals was big at that time) and Restaurant Anna Amalia. All three are famous for their long history of extravagantly classical cuisine in an authentic decor. Anno 1900, close to Goetheplatz, offers slightly more exotic creations but be sure to make a reservation (online booking available) as their creativity and homemade gourmet food draws in guests from all over the area. One of the most beautiful hostels I have ever been to is located right in the city center, the Goetheplatz. It has a number of two-bed rooms for maximum privacy at very good prices and a cozy common-room where you can get breakfast, cook your own meals or relax with a book from their free library. It has multiple-bed rooms as well if you’re traveling in a group or looking to meet fellow travellers/ do not mind sharing a room for even cheaper fares. If you’re looking to stay in a hotel, you can either choose from a selection of historical hotels in the city center, many of which have their own in-house restaurants or check in at the Leonardo, just a short drive or walk away. Here, your educational day of sightseeing can be followed by a relaxing evening at the spa, including a hot tub, pool and sauna. 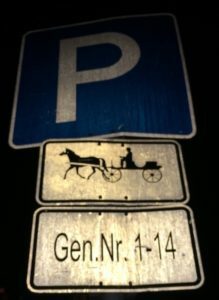 It is right next to the Park an der Ilm, so your morning and evening walks to the center could hardly be more scenic, whether you’re strolling through a winter wonderland or frolicking beneath blooming trees in spring. None of these options will cost you a lot of money thanks to eastern Germany’s wonderfully low real estate prices. 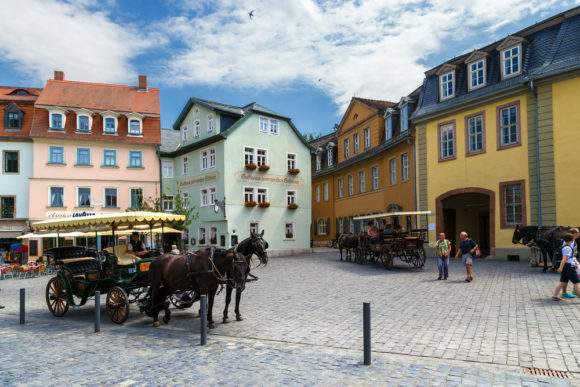 Located in the heart of Thüringen, Weimar is only a three and a half-hour drive from Kaiserslautern and Stuttgart and about an hour closer to Wiesbaden, so if you’re not looking to spend the night, you can absolutely turn it into a day-trip as well. The reiseauskunft.db.com often has special offers from €29 each way and buses can be booked via flixbus.com from €13 (Wiesbaden/Frankfurt), €18 (Stuttgart) and €27 (Kaiserslautern). Getting around is easy thanks to public buses but most things are in walking distance of each other, so make sure to bring comfortable shoes and nothing can go wrong. Author’s profile: Leonie is a poetry-loving literature student with a passion for small towns, road trips, and breakfast food that’s being served at all hours of the day. When she isn’t hopping from one bargain flight to the next, she is making sure you’re hanging with the locals and staying updated on events in your area. Klagenfurt, Austria - experience gorgeous lakes, spectacular views of forest covered hills and soaring mountains which tower over the cityscape.